A traditional Scottish song, sometimes known as Home Of The Whale Recorded by Massive Attack, Mary Black, Caroline Lavelle. 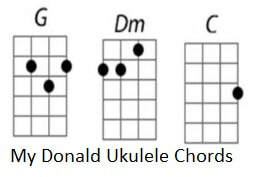 The ukulele chord shapes are included. The youtube version is by Bert Jansch who is a finer guitar player that I'll ever be and it's the best version I could find. ​Surprisingly this one was recorded by Massive Attack who are more known for pop/hip hop music than folk song.